Rotational stretch: Inhale and place your right hand on the outside part of the left knee and wound your left arm behind the chair. As you exhale, push your left leg with your right arm and rotate your spine without moving your hips. “Imagine squeezing water out of a wet towel,” says Vesna Pericevic Jacob, founder of Vesna’s Alta Celo, a fitness studio in Delhi. Forward bend: Inhale, raise your arms overhead. Now as you exhale, fold forward from the waist, slowly taking your chest towards the thighs. Let your arms touch the floor and relax your shoulders. “Think that your shoulder blades are falling away from the neck. Relax completely,” says Dr Paul. This releases tension from the spine, and stretches the lower back and hamstring muscles, he explains. 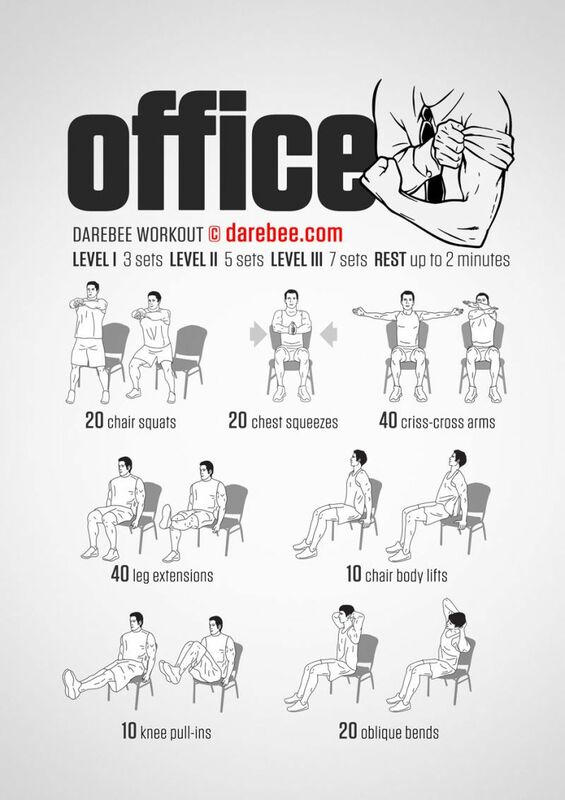 Here’s how to use your chair to exercise. Knee lifts: Tie the elastic inner-tube of a bicycle tyre or a TheraBand resistive exercise band to the leg of the chair. Loop the band around your right foot in the sitting position. Now slowly push your leg up and straighten your knee and then slowly take it back to the sitting position. Do this for 1-2 minutes and repeat with the left foot. “Aim for 10-15 repetitions, twice a day,” says Ameet Pispati, director, orthopaedic surgery department, Jaslok Hospital, Mumbai. Sit-stands: Sit on a chair and fold your arms across your chest. Get up slowly and stand straight. Slowly, sit back the same way. Repeat this movement for 1 minute to strengthen your knees and get rid of knee pain, says Dr Pispati. Hip adduction: Keep your feet together. Make a fist or use a tennis ball and place it between your knees. Squeeze your knees together, hold for 10 seconds, then relax. Repeat five times.“This strengthens your inner thighs and knees,” says Dr Paul. Hip abduction: Tie a resistance band around your legs, just above the knees. Slowly move your knees apart as far as you can get, working against the resistance of the band. “Repeat this two-three times and you’ll strengthen your glutes, tensor fascia latae muscles that work to draw your leg away from your body,” says Vinod Channa, a celebrity fitness expert based in Mumbai. Flutter kicks: To strengthen your hips, says Dr Paul, sit on the edge of the chair, place your hands on the back. Now raise both legs, keeping them parallel to the floor. Kick the left leg up and right down. Alternate. Hamstring contraction: Sit on the edge of the chair, arms by the side. Extend your right leg out straight, toes touching the floor. Flex your foot so that the right heel remains on the floor. Contract your hamstring muscles and press your heel on the floor. Now lift the leg, slowly, as high as you can without rounding your back. “This engages the shins, ankle and hamstring muscles,” explains Dr Paul. Half squat: Stand in front of the chair, facing away from it, with your feet shoulder-width apart, back straight, shoulder down, toes pointed slightly outward. 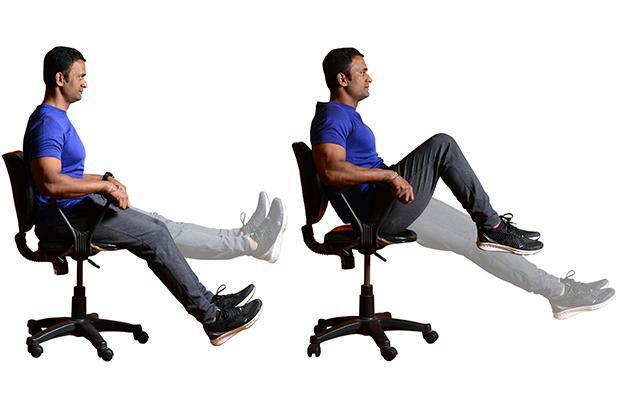 Slowly lower your body down and back, as if you are sitting on the chair until your thighs touch the chair. Rise back up slowly and repeat 10 times. “This will build your quads, hip muscles and hamstring core,” says Channa. Ankle rolls: Lift your left foot a little. Without changing the angle of your leg and keeping the back straight, write your name with your toes, rotating your ankle. “This stretches and flexes the ankle to the maximum,” says Chhikara.